Wheelersburg improved to a perfect 21-0 with a road contest against Valley Friday seperating them from a perfect 22-0 regular season. WHEELERSBURG – From the get-go of Wheelersburg’s home senior night contest with SOC II rival South Webster, much like they have been in the 20 games prior to Tuesday, the Pirates were locked in. Wheelersburg led after the first quarter 21-12, and except for a brief period when South Webster went on a 14-0 run themselves, the Pirates never looked back, claiming an impressive 72-49 win over the Jeeps. Ater couldn’t be more spot on. 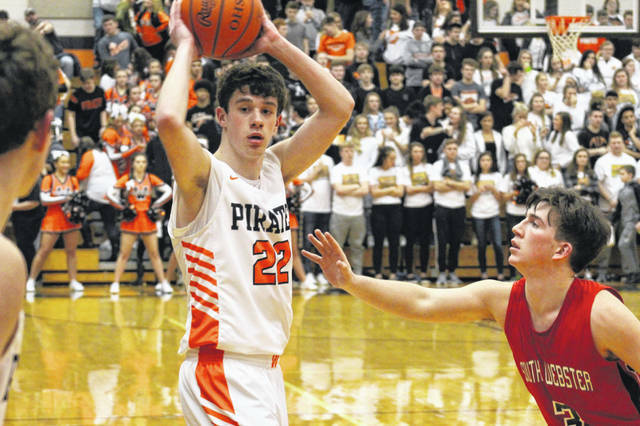 The Jeeps usual trio of Shiloah Blevins, Braden Bockway, and Tanner Voiers combined for just 27 points as the Pirates pressured the ball, and off the ball, an inordinate amount in their 23 point win. When told that stat, Ater audibled, “Wow”-ed, as anyone would if you told them three of the most talented scorers in the conference were held to those numbers. With Tuesday being the senior night for six Wheelersburg seniors, (Tanner Holden, Trent Salyers, Dustin Darnell, Connor Mullins, Ashton Clevenger, and Justin Salyers), they leave a lasting legacy for future Pirates in a season where they were outright SOC II champs for the first time under Ater, the number one seed in sectional seeding, and are one game away from a perfect regular season. If you were to ask Ater before the season if a perfect regular season was feasible and one of the goals of this Pirates team, he may have thought there was an outside shot of achieving a lofty goal. With a road trip to Lucasville to face the Valley Indians standing between his club and perfection through their first 22 games, Ater, nor his team, is focused on achieving something that hasn’t happened at Wheelersburg since 1988. Rather, they’re focused on taking each battle one game at a time and continuing to check off each box on their list of accomplishments, one that in theory has a trip to Columbus in late March near the bottom. https://www.portsmouth-dailytimes.com/wp-content/uploads/sites/28/2019/02/web1_IMG_9711.jpgWheelersburg improved to a perfect 21-0 with a road contest against Valley Friday seperating them from a perfect 22-0 regular season.